Grids, I just can’t get enough of them. 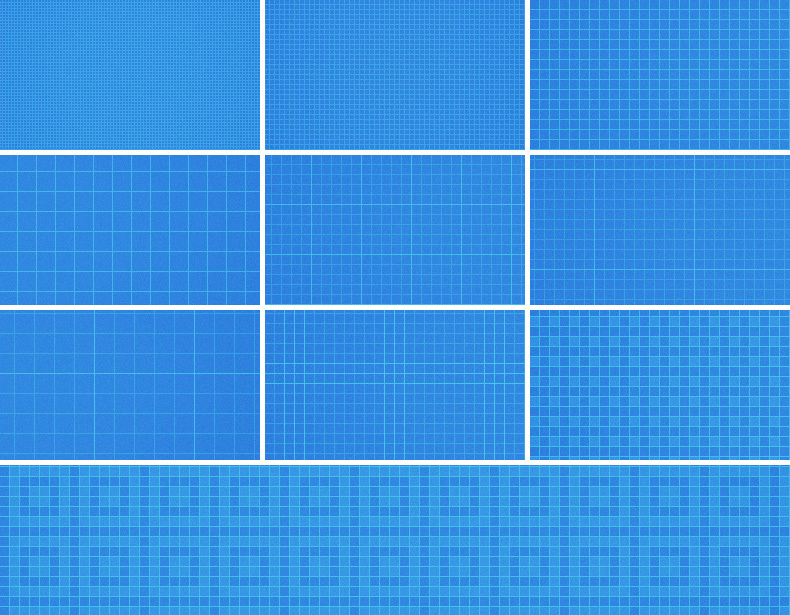 Today I’m giving away 20 seamless grid patterns for use within your designs. These will come in ultra handy I’m sure. Grids patterns are so versatile that with a few blending options you can create interesting web backgrounds (take a look at Chris Spooner’s Line25 blog), notepaper, blueprints… the options are endless. The Photoshop patterns (.pat) come in both black and white with a transparent background meaning they can be applied to almost any element or colour. Also in the download is a set of 20 500px x 500px transparent .pngs – one for each pattern. This is great Orman, I was actually looking for something like this the other day. I brought this one forward seeing as you asked for them :) Hope you enjoy them! NICE, thats really great! Thank you for sharing! Once again Orman, thank you! New favorite design resource website. You’re awesome! Thanks Orman! It was an error on my behalf.. Keep up the excellent work! Great Job!!!! I love all your work… Now I a big fan of you!!! Nice work. Thanks for sharing it. Thanks for the patterns, man. This is exactly what i was looking for. Will integrate it to the website i am creating. I am curious about your blog. Does it bring you customers ? These are bloody brilliant! Big big timesaver, you sir, are a legend! Great website! Thanks for sharing everything with us! One question I had was about the background of your preview, how would I go abouts to achieve the same effect? Oh but what I meant was the blue background. Not the grids themselves. Thanks for your answer! I’m sure its a simple background gradient, if I’m not mistaken. Can you re-upload it ? Ok sorry, it worked after 7 or 8 attemps. loving these! thank you so much! Using these a lot lately. Thanks for creating and sharing them with us. I need sth like this. Thank you very much. You saved my time. Orman this is very nice, thnkx for save my lots of time. Very useful patterns, thank you very much Orman! Love these for my projects! Really needed this just now, thank you. just exactly what I was looking for. very generous. Great Thank you for sharing! Thank you so much, these grid lines are great! great collection! i just loOooove all grid backgrounds! Tried to make my own, blah! Thank you so much!! Orman, your a star mate, thanks! thank you! really great stuff! Thank you Sir! You saved me from some extra work.